Well, your kiddo may have done his best to prevent a zombie breakout but we’re sorry to say, it wasn’t enough. It looks like patient zero took a pretty nasty bite out of him and he’s been forced into the zombie army that is taking over the world! Now there is only one thing to do. Take your little ghoul around the block to collect as many tasty treats you can before the zombie apocalypse ends the world, as we know it! 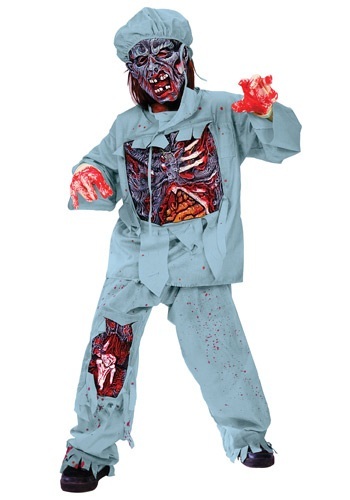 This Child Zombie Doctor Costume will transform your youngster into a fun and, rather, original creature of the night. Sure, just about anyone can dress up as a rotting corpse and walk around the block but your little one doesn’t need to follow the rest of the horde. He can be a zombie with a Ph.D.! At one time he was a master surgeon and then the virus overtook his body. All wasn’t lost, though. His mind is still in tack, and now he can run through the streets as more than just another mindless brain muncher. A zombie with smarts sounds like the stuff of nightmares, and that’s exactly what your kiddo will be this year; a NIGHTMARE! As if people aren’t already scared enough of going to the doctor’s office with all the needles and what not, but now they have to worry about their surgeon taking a few bites while operating? Greaaat. Help your child become the scariest monster in the neighborhood this year by dressing him up in this Zombie Doctor Costume. Everyone will be terrified when even an apple a day won’t keep this doctor away!